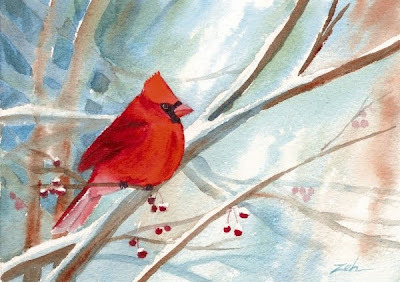 A bright cardinal huddles on a snowy branch, his feathers fluffed to keep him warm. A few red berries still hang from the branches. This is a scene from outside my studio window. This painting is sold. See more of my art for sale at zehoriginalart.com. Have a great day!